There is finally a finish to share with all of you. My very first Prim finish!! I had a freebie chart from Primitive Bettys from some time ago and finally stitched it up during our anniversary camping trip (more on that in another post!). I am pleased with the finish and worked messy stitches around the border to give it that prim look. I stitched it on Old Salem linen with WDW threads charcoal and olive, which I used for the key and the "flowers" on the word Crow. Stitching it made me feel like Autumn is around the corner, which it is! The days are still warm here but with that fall scent in the air. I have 3 other finishes I am still working on, adding trims and what not, so I will post photos of that shortly. Here's a sneak peak to the backs. 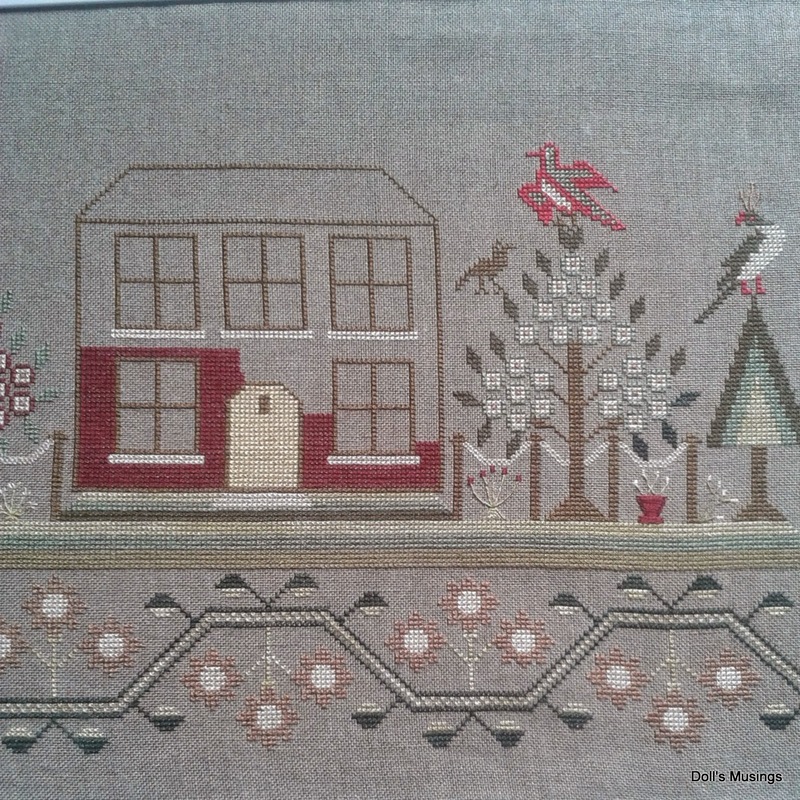 As for stitching, Sarah Chapple has been a wonderful sampler to work on. I probably have said this a lot! Well, she has been a pleasure to stitch so why do anything else right?! So I finished adding some fancy birds and am currently "painting" in the red on the house. It's great to work on in the evenings when we watch a show as I don't have to count or concentrate that much. Before our anniversary trip, I met up with Melissa from Words and Blooms. We had a lovely time together and she showed me the most wonderful sewing store, Spools of Thread, where I had to get a few pieces of the delicious fabrics just because! Melissa has been on a sewing kick and is making really beautiful tops and tunics. She started another blog called A Closet Full of Posies, great name by the way Melissa! Do check it out and see the fantastic clothing she is making! I love meeting up with Melissa, having a good chat and poking about Vancouver. 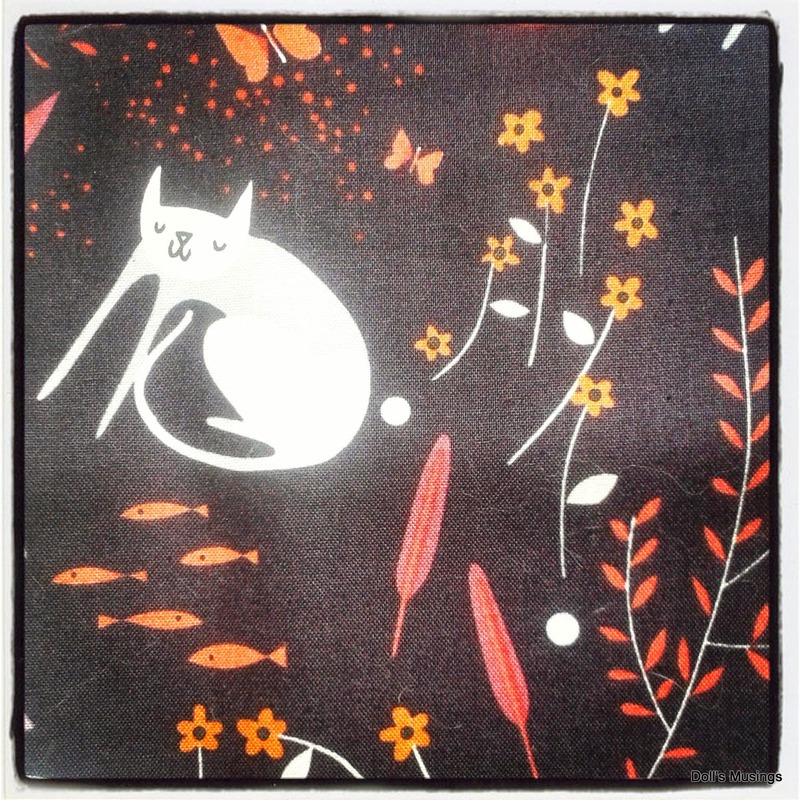 I managed to sneak in the same cat fabric but on white for Melissa as a little gift for her. She gave me an OTT light as she had an extra lying around and I've been using it to stitch at night. Wow does it make a difference in seeing what I'm doing!! Thank you so much my dear!!! Who here remembers an old HAED pattern I started stitching a few years back? Tea Bath Fairy! Well, I dusted her off an added in a bunch more pink to the cup, leaving the metallic threads to fill in later. Since I'm on a buying fabric kick (for no apparent reason), I bought some fabric from Terri, Dixie Sampler. She shipped it so quickly and sent a sweet little card along with the package. She has been dyeing some lovely linens to purchase too, although they are all sold out since many of the members from the facebook Prim Society group have been buying them up like hotcakes!! Hopefully next time I can get my hands on some of her linen!! Watch for a post on our Ruckle Beach anniversary trip! I thought I'd devote a post to that instead of making this a super long post. Happy stitching, knitting, crocheting, making, sewing, everything!! A very cute little prim and lots of lovely fabric. What fun to meet up with a fellow blogger! Cute finish Anne. 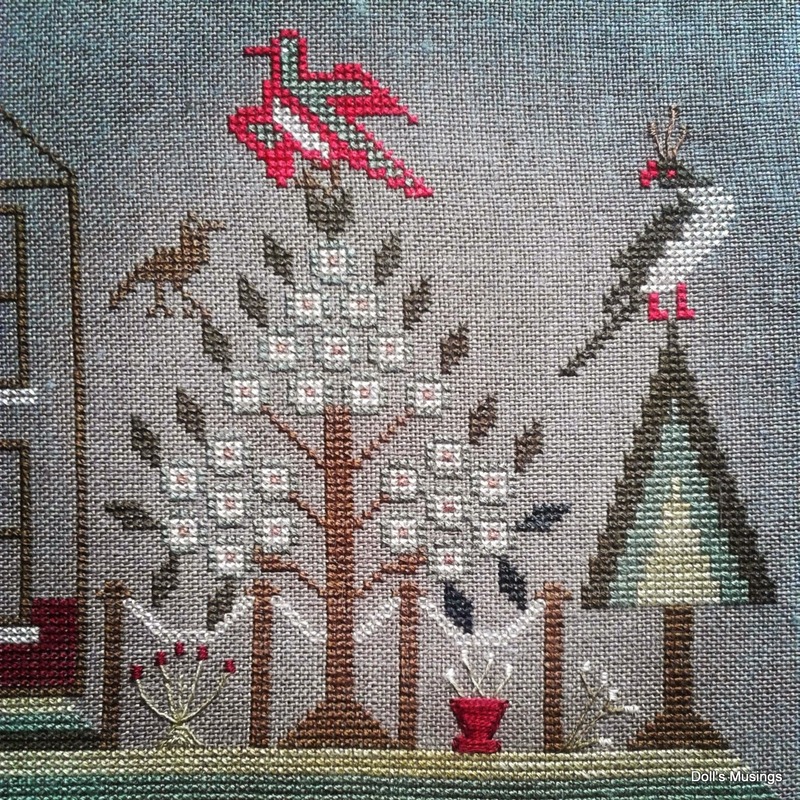 Love the sampler that your working on. Sounds like a fun time with Melissa. Loving the acorn fabric and I'm beyond words on that kitty fabric. Sooo cute! I like areas where I don't have to think about counting too. Perfect for entertaining myself while my husband plays video games. Wonderful WIP, very nice indeed. 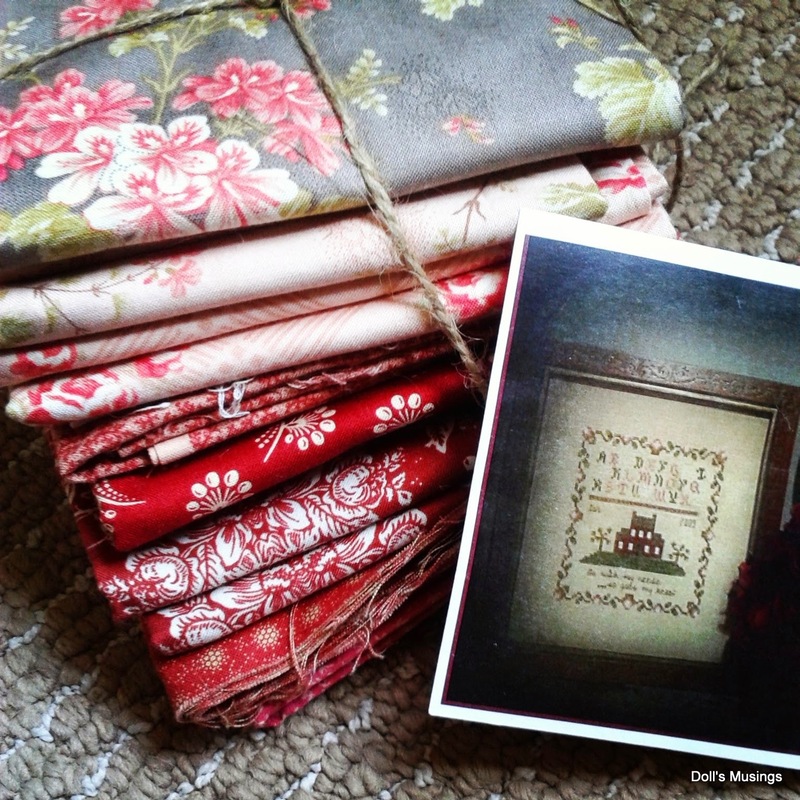 Lots of lovely fabrics you've added to your stash collection. Your prim pillow is so perfectly prim! And Sarah is looking good. Fun to meet a stitching friend and find a great store. You have sure have lots of new fabrics to play with! Terri's linens just fly off her page.. it's amazing! What a fantastic finish...and those 'messy' stitches are just perfect!How lucky you were to meet up with a fellow blogger. Tea bath fairy is a wonderful design, can't wait to see more of her. Beautiful finish. Looking forward to seeing your other finishes. Lots of yummy fabric you got. Your prim finish is just lovely and the finishing is so appropriate! 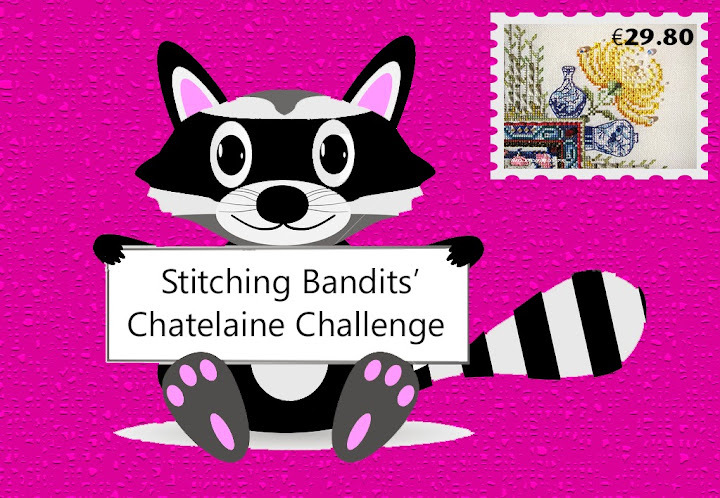 What lovely stitching, Anne! The prim Crow piece is so cute and I like the fabrics you chose for the backs of those pillows! 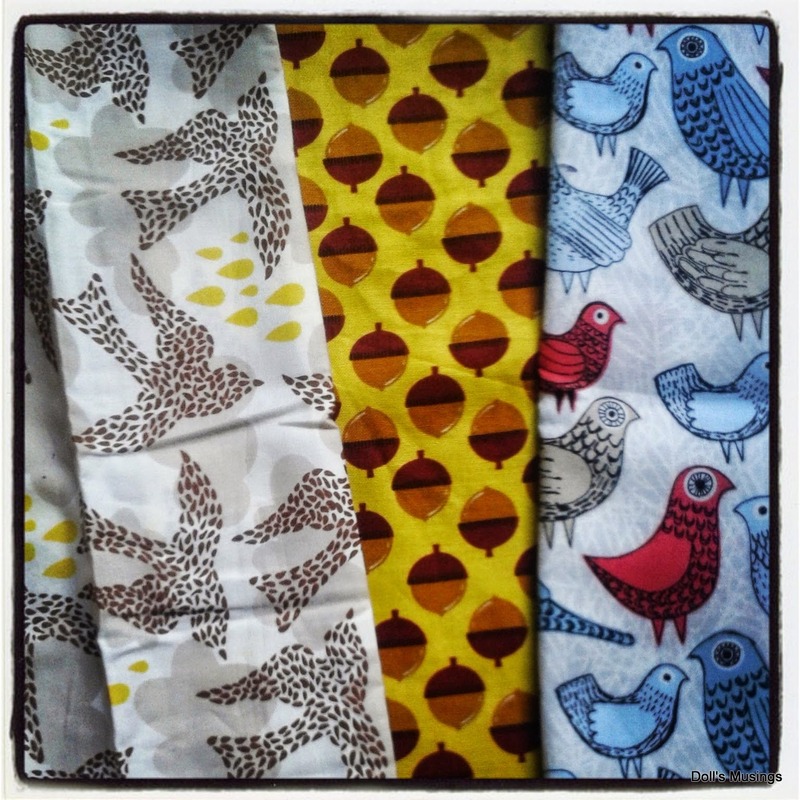 I didn't take a good look at the fabrics that you'd bought @ Spool's but I really like that bird fabric on the left. Nice excuse to go back for another browse! Nice fabrics you got from Terri! It was fun to catch up with you in person! Thanks again for the kitty fabric! I'm off to answer your other emails. Love your crow finish. I have not stitched it yet. 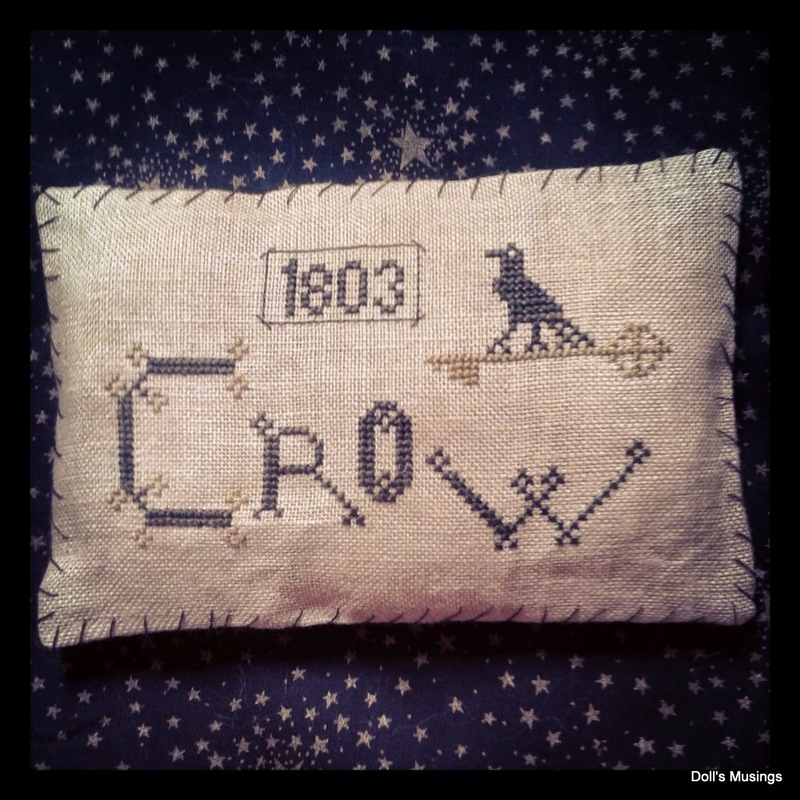 Great post, the little crow pillow is very sweet and suitably finished too. You have certainly got some lovely new staah too. I do remember Tea Bath Fairy, I was stitching a Coffee Cup Fairy at the same time! Love your primitive finish. Great finds with all the fabric. Can't wait to see what is stitched behind the beautiful fabric. A great finish. Wonderful fabric too. 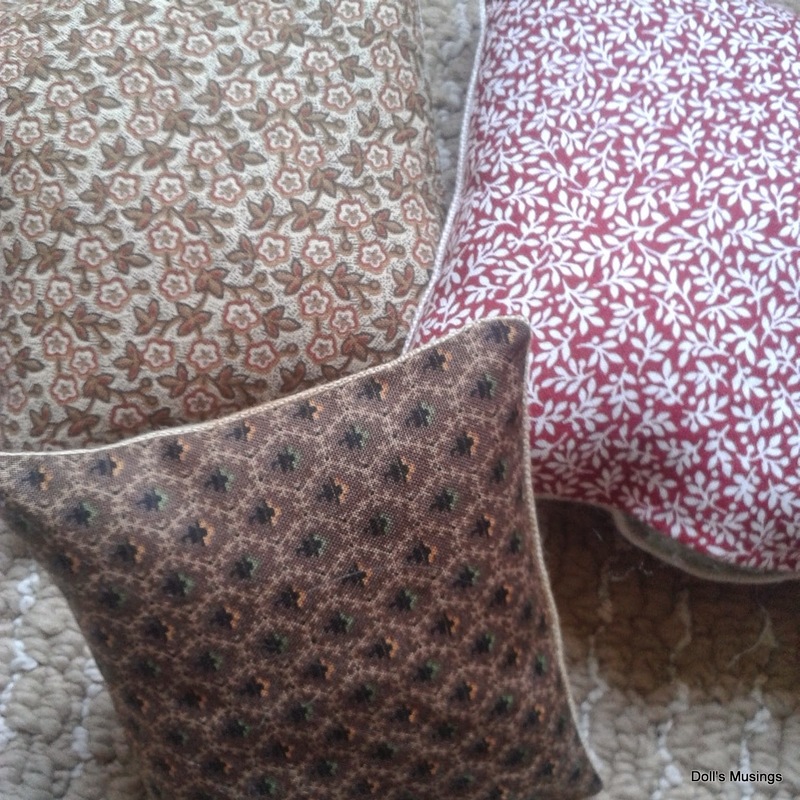 Wonderful stitch and fabrics I love in special way those of the back of pincushions! Love the prim pillow and your sampler is beautiful. What fun to be able to get together with Melissa and even shop together. I'm already a big fan of her new sewing blog. So many beautiful pieces you're working on! Really like the Crow finish and the fabric backing material is lovely. Your Sarah Chapple looks great--the paint color you chose for the house is perfect! Hope things clear up with the strike soon--Melissa filled me in it a bit and it sounds very frustrating... Sending you big hugs! Hope you had a awesome great time togehter. Can't wait to see the post about it. What you have been doing. You havent sit still with crafting. So many stitches have been made. Prima looks great with your messy look. And your head (I never could understand people stitching such big projects. I get tired to fast I think with lange long projects) What I can see from it too. Hope to see more if it soon. How great you met with a blogfriend. You must had a awesome day. I know how it Is. Hohihihihi. Beautifull fabric. Also the ones you bought. You can do some serieus crafting soon. How Is your granny stripe blanket?? Soon we see much more. 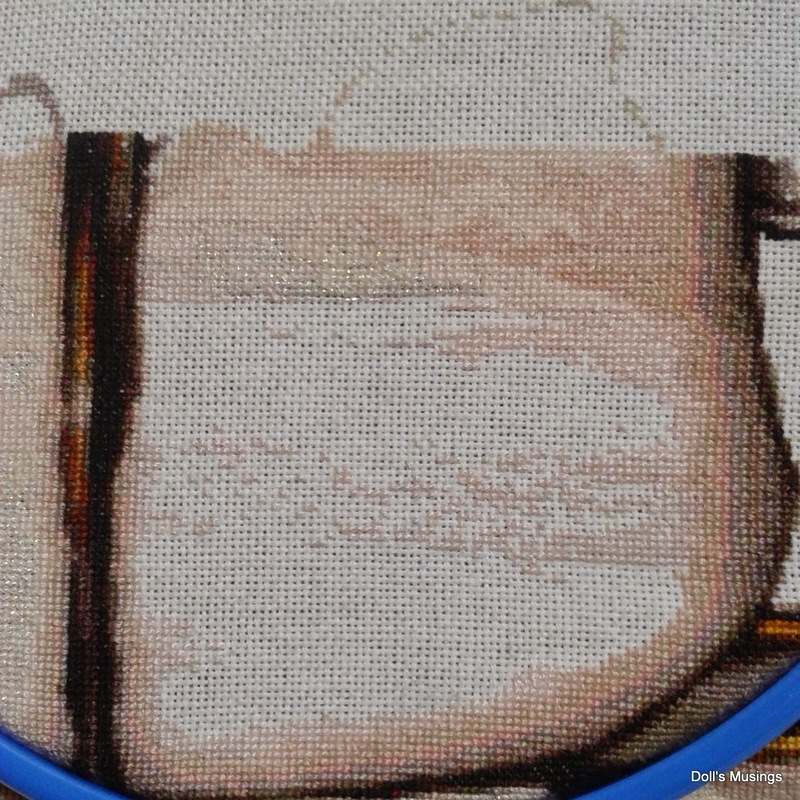 Lovely finish and progress on your sampler. Oooh yes I remember Tea Bath Fairy! Lovely to see her out again. Congrats on your first Prim finish. It turned out nice. I find that I buy fabrics "just because" too. LOL I have two huge bins of fabric in my basement. Just like my XS stash, I don't need to go to the store to find a finishing fabric... well, not usually anyway.